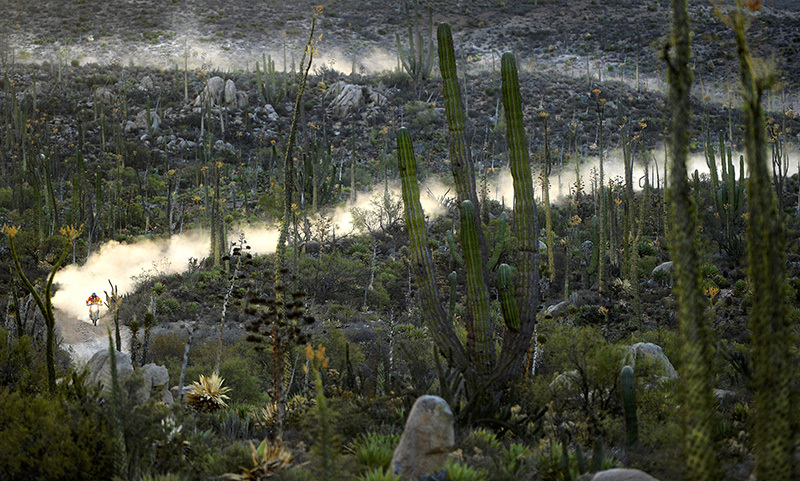 Colton Udall drives his 450cc motorcycle through a field of Saguaro cactus during the 2013 SCORE Baja 1000 on November 15, 2013, near mile 400, just east of Punto Blanco in Baja California, Mexico. His team, the Johnny Campbell Racing Honda Team, made up of Colton Udall, David Kamo, Tim Weigand, and Mark Samuels, overcame injuries and a broken wheel to top the leaderboard once again. They completed the 883-mile race in 18 hours, 29 minutes and 14.240 seconds with a 47.8 mph speed average. It was the 17th straight year that a Honda motorcycle took top honors at the 1000. This year's Baja 1000, however, was marred by the death of FMF/Bonanza Plumbing KTM Team rider Kurt Caselli who was leading late in the race, along with teammates Mike Brown, Kendal Norman and Ivan Ramirez, while in a close battle with the JCR Honda squad when he crashed in a sand wash, suffering a fatal head injury.